Tropical Storm Franklin, the sixth named storm of the 2017 Atlantic hurricane season, continues to strengthen as it targets Mexico's Yucatan Peninsula at near-hurricane strength tonight. 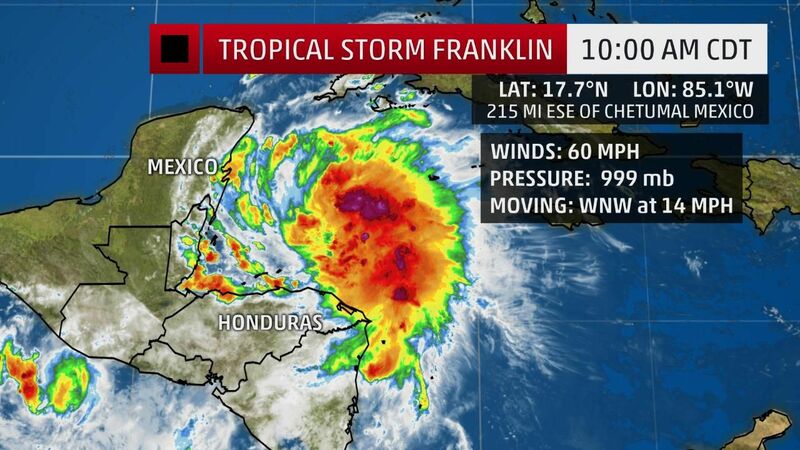 The center of Tropical Storm Franklin is located over 200 miles east-southeast of Chetumal, Mexico, moving to the west-northwest about 10 to 15 mph. A hurricane watch has been issued by the government of Mexico for a portion of the Yucatan Peninsula fom Chetumal to Punta Allen. This does not include Cancún or Cozumel. This means hurricane conditions are possible in these areas. Tropical storm warnings extend over most of the rest of the Yucatan Peninsula, including Cancún and Cozumel, and as far south as Belize City. A tropical storm warning means that winds in excess of 40 mph are expected and that preparations for the storm should be rushed to completion. Belize and the Caribbean coast of Mexico's Yucatan peninsula should expect rainfall to increase starting early Monday afternoon. Winds of 40 mph or greater may begin in the Yucatan peninsula and northern Belize as soon as Monday afternoon, as well. The environment around Franklin is improving and it is increasingly possible Franklin could strengthen to the season's first hurricane prior to landfall tonight. Residents of the Yucatan Peninsula and Belize can expect 3 to 6 inches of rain with locally higher amounts, likely to trigger local flash flooding. In addition to the heavy rain, waves in excess of 10 feet could reach the eastern Yucatan coast, including Cozumel and Cancun, by tonight, lingering into Tuesday. A storm surge of 2 to 4 feet is possible with the arrival of Franklin near and north of the center tonight, according to the National Hurricane Center. Franklin will then move into the southwest Gulf of Mexico (Bay of Campeche) by late Tuesday, and may gain some strength before making a final landfall in eastern Mexico Thursday. High pressure in the southern U.S. should remain strong enough that Franklin will not directly affect the U.S. However, high surf, rip currents, and possibly some minor coastal flooding should affect southern Texas on Wednesday and Thursday. We've now entered the portion of hurricane season when every potential system must be watched closely for development and potential impacts to land. About 80 percent of all hurricanes in the Atlantic have developed from August through October. It has been almost five years since a hurricane made landfall in the United States during August. The last one was Hurricane Isaac, which struck Louisiana on Aug. 28, 2012.